From Middle English mermayde (“maid of the sea”), from mere (“sea, lake”) + maid, equivalent to mer- +‎ maid. 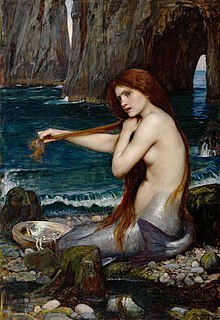 Compare Old English meremenn, meremennen, meremenin (“mermaid, siren”). A mythological creature with a woman's head and upper body, and a tail of a fish. (as a modifier) Coloured a brilliant turquoise. This page was last edited on 21 April 2019, at 10:10.